I'm really getting excited about the demonstrator pre-order I'll be able to place on May 2, which is one of the benefits of being a Stampin' Up! demonstrator. 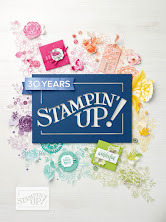 I already have several stamp sets and dies from the new catalog that I was able to order or won as part of the benefits of attending OnStage in early April. So, today, from my OnStage swag, I'm using the Fabulous Flamingo set. I picked a Calypso Coral base card and used that color ink for my flamingo. I found a wonderful complimentary paper from the new Delightful Daisy Designer Series Paper (DSP) Pack from the upcoming catalog, and used the mini striped black and white accent paper from the Pop of Pink DSP from the current, main catalog. I stamped the water in Marina Mist, and stamped the water reeds in Pear Pizzaz. The flamingo was stamped in two steps. The body was stamped in Archival Basic Black. Then another part of this stamp added the legs and color to the body. Then I decided to finish coloring the body by using Calypso Coral ink pad and an aqua painter, rather than using the third stamp in the set meant to color the body. I also did a little coloring of the water with an aqua painter and Marina Mist, which didn't show up well in the photograph, but looks really nice in person. The sentiment is also from the Fabulous Flamingos stamp set. The set includes several sentiments, but this one was a card going to my Mom, and was perfect for my needs. I stamped it in Archival Basic Black ink and then used the Stitched Shapes Framelit dies and the Layering Oval framelits Dies to matt the sentiment. I think I'll be using this fun set a lot this coming year. It makes me feel like an artist because of the shading and elements I can choose to add. If you're a demo placing an order when the new catalog ordering begins tomorrow (May 2), don't forget to add items from the Clearance Rack that coordinate with items you already have. Clearance Rack items are retired products that are available at deep discount, and only available while they last. 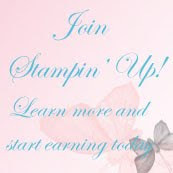 Ordering all items at once will likely save you shipping costs, and could qualify you for stampin' rewards. 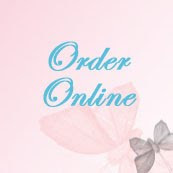 See these items in the on-line store. 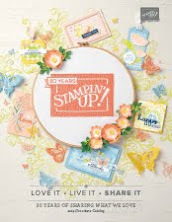 Also, if you're a demo placing an order May 2, or a customer looking for more retiring bargains, check the Retiring Items list again on May 2 for any newly reduced items that Stampin' Up! might add to the list. Snap up these items quickly as any new sales items will go fast. As accessories sell out, they will no longer be available. However, retiring stamps will be restocked until May 22 and then sold only while they last. See the products retiring May 31 and check for additional reductions on May 2. May 02 - Demonstrators can begin placing pre-orders from the 2017-2018 Annual Catalog from a limited selection of new catalog merchandise. Demos can access a down-loadable copy of the new June 1 catalog on line at the demonstrator-only website, and can place a demonstrator pre-order from a pre-order brochure of new catalog items. You'll want to get your orders in early in the day so your order ships asap and you can participate in demo-only swaps and to have samples to show from the new catalog. Sign up or re-sign up as a demonstrator now so you can order early and also order your new catalog merchandise at demonstrator-only discount prices. November 2018 - Orlando - Stampin' Up! 30th Anniversary and OnStage events. The 25th Anniversary in Salt Lake City was a blast, with more prize patrols than usual and special parties. You won't want to miss the celebrations planned for the 30th Anniversary.